The Gophers (shown here in a file photo) won Saturday over RPI in a performance that was impressive, in the respect that Minnesota rebounded from a disappointing tie Friday. MINNEAPOLIS — The Gophers were hoping to be playing for a tournament championship Saturday night, and they also hoped to face the No. 2 team in the country. Instead, Minnesota found itself in the consolation game of the Mariucci Classic against RPI. Perhaps the Gophers took out their disappointment on the Engineers, as Minnesota routed RPI by a 6-2 final at Mariucci Arena. "I think our team responded well tonight," said forward Travis Boyd, who had a goal and two assists. Minnesota tied Colgate on Friday in a game that felt like a loss since the Raiders, not the top-ranked Gophers, won the shootout to advance to the tournament championship to face No. 2 Ferris State. The beginning of Saturday’s game was a continuation of Minnesota’s disappointment, as RPI took a 1-0 lead at the 15:57 mark of the first period on a shorthanded goal by Brock Higgs. The puck appeared to bounce off a Gophers skater and snuck past Minnesota goalie Adam Wilcox. Less than four minutes later, however, the momentum of the game shifted completely as Connor Reilly found the back of the net with 53 seconds remaining in the first period. That goal carried the Gophers after the first intermission, as Boyd made it a 2-1 Minnesota lead just 21 seconds into the second period. Kyle Rau beat RPI goalie Scott Diebold on a rebound 58 seconds later — three Gophers goals in a span of 2:02 — to put Minnesota up 3-1 early in the second. "That was huge," Boyd said of Reilly’s goal. "We came out maybe not the exact way we wanted to, so getting that goal like that to get some momentum going in the second was definitely huge." It was the first game back for Gophers head coach Don Lucia after he led the United States in the World Juniors tournament in Sweden. He and players Brady Skjei and Hudson Fasching didn’t arrive in the Twin Cities in time for Friday night’s game against Colgate. In fact, Lucia didn’t see the results of that contest until Saturday morning — he admitted he didn’t realize Friday’s game was televised. With Lucia back on the bench, the Gophers picked up where they left off before he left. "It’s good to get back with the guys," Lucia said. "I really haven’t seen them play since our Saturday Michigan State game (on Dec. 7). It’s always nice when you’ve been away from the guys. You probably love them a lot more than when you’re with them all the time. It was good to be back around them." Gophers freshman Justin Kloos netted his seventh goal of the season at the 6:49 mark of the second period to push Minnesota’s seemingly insurmountable lead to 4-1. But RPI chipped away and scored 6:57 into the third on a goal by Matt Neal to trim the Gophers’ lead to 4-2. Later in the third, it appeared the Engineers scored again to make it a one-goal game, but RPI’s Jimmy DeVito was whistled for interference on the faceoff just before Ryan Haggerty’s slapshot beat Wilcox. What could have been a game-changing goal for RPI turned into a power play goal for the Gophers. Rau buried his second of the night to effectively end the game by putting Minnesota up 5-3 at the 11:18 mark of the third. "It was a bad call, but that’s not why we lost," said RPI head coach Seth Appert. "It was a big moment. Obviously it would have been 4-3 with eight minutes to go. But that’s not why we lost. We lost because we came out uncertain of ourselves and not 100 percent committed to play the way we needed to play to beat a team of their caliber." 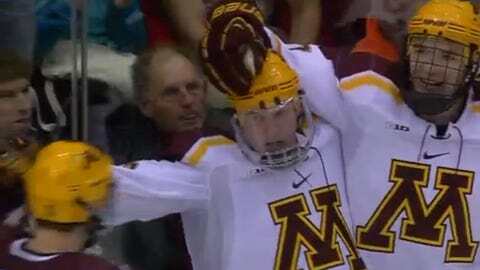 Seth Ambroz’s empty-net goal with 2:31 to play put the finishing touches on Minnesota’s 6-2 victory. It might not have been the championship game of the Mariucci Classic, and it wasn’t against the nation’s second-ranked team. But the Gophers’ win was impressive nonetheless as Minnesota rebounded from a disappointing tie Friday. "We kind of said we can (say) last night was a little rusty. If you take 27 days off, it’s not going to be great coming back the first game," Boyd said. "We weren’t happy about (Friday), but at the same time we knew we were going to play better tonight. I think we did that. We’re definitely confident moving forward getting back into Big Ten play."